Dedicated to real estate clients’ success, Katie creates individualized plans to achieve their goals. 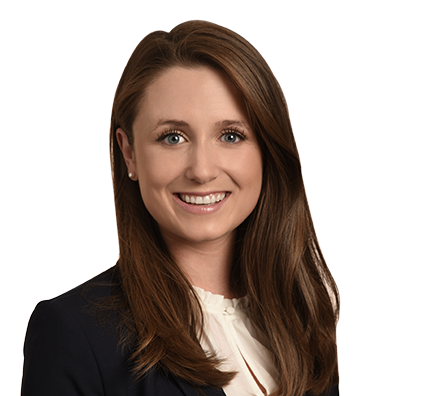 Katie practices commercial real estate law, representing sellers, purchasers, developers, tenants, and landlords on complex real estate transactions. Projects include the development, acquisition, disposition, financing, construction, operations and leasing of office, retail, hotel and multifamily projects. Clients appreciate her extensive experience with title, survey and due diligence review and preparing documents related to the acquisition, development and operation of commercial property. Katie also has experience with entity formation, organization and restructuring, including preparing entity operating agreements, effectuating mergers and assisting with other organizational matters. With a passion for helping people, Katie takes personal ownership and responsibility for client objectives. She collaborates with clients to create business goals along with a plan to achieve them. A true advocate for clients, she works diligently to deliver finished projects with desired results. Assisted multifamily developer with the acquisition of high-end apartment projects in Texas. Assisted large national retailer in connection with the leasing, acquisition, and disposition of “big box” projects across the country. Assisted hotel developer with the acquisition and financing of hotel projects in Texas and Georgia. Assisted real estate investment partnership with the merger and reorganization of its entity structure. Advised national shopping center developer with respect to Texas leasing matters. Represented non-profit organization in the disposition of an Autism Academy in Missouri. Advised hotel developer in the negotiation of management agreements for various hotel projects. Assisted large national retailer with respect to real estate due diligence matters in connection with the acquisition and development of property in Texas, Michigan, Rhode Island, Arizona, and Georgia. Assisted multifamily developer with the disposition of housing and apartment projects in Texas. Assisted wind farm developer with respect to real estate due diligence matters for Texas alternative energy projects. Katie and her husband are avid golfers and tennis players, and can be found on the court or hitting the links together nearly every weekend. They like to cook and entertain family and friends at their home. They also enjoy traveling. Katie is also a piano player.